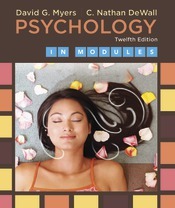 Psychology in Modules, a full-length introductory psychology text (identical to the full-length Psychology except organized into 55 short chapters called modules) published by Worth Publishers. The easy-to-digest modules (averaging 12 pages) have few cross-references. This enables instructors to assign the modules in their own preferred order.